DON LYDICK was born in Cass Lake, MN and raised in the Upper Peninsula of Michigan where he attended Calumet High School in Calumet, MI. He then went into the Air Force and spent 3 wonderful years near Istanbul, Turkey which enabled him to travel to various countries. He returned to McGuire AFB in NJ, where he met his wife Janet. Deacon Don and his wife Janet came to us from Manalapan, NJ in July, 1997. They were married on Oct. 7, 1961. They have three daughters, seven grandchildren and two great grandchildren. Deacon Don officiated at his two oldest daughter's weddings, baptized all of his grandchildren, including his great grandchild and married his granddaughter and another one in 2011 and gave them all of their sacraments. In addition he also went to Southern France to officiate at the wedding of their cousin's daughter and also baptized their granddaughter. 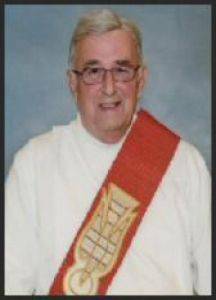 Deacon Don was ordained on May 12, 1982 in the Diocese of Trenton and held various positions, including Assistant Director of the Family Life Bureau and the committee that formulated the Annulment process in the Diocese. They were members of St. Gabriel's in Marlboro, NJ for 25 years where he taught a Confirmation class for over 20 years, directed a Folk Group with his daughters a guitar players, in addition to various other ministries. 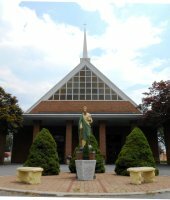 Deacon Don was assigned to St. Ann's Parish in Bethany Beach until his recent move to Cannery Village in Milton, DE, where he is now assigned to St. Jude's.